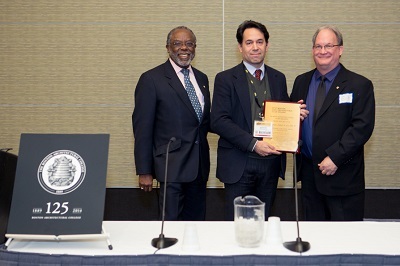 The Boston Architectural College is pleased to announce that Anthony Frausto-Robledo '96, AlA, LEED AP was honored with the 2013 Alumni in Practice Award for Architecture on November 20, 2013 at the BAC Reception at ABX. Anthony was nominated and selected to receive the award by his Alumni peers who gratefully acknowledge the contributions he has made to the profession at the intersection of computer technology and the design process, informing the global architecture, engineering, and construction communities. The BAC Alumni Association presents Practice Awards to alumni who have made significant contributions to the design community. Alumni who receive this award are considered to be those who bring honor to their professions and provide exemplary service in the fields of architecture and interior design. To read more about the award and the award recipient, click here.